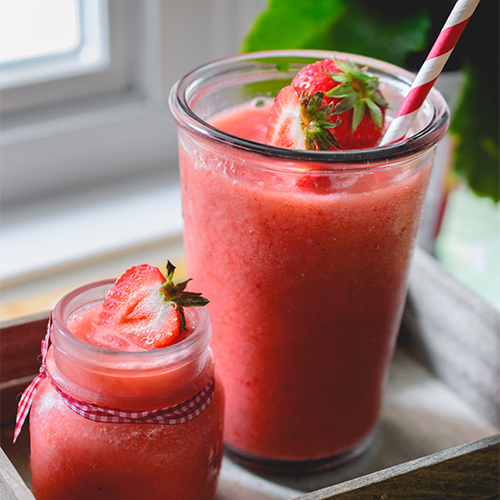 Whether you're planning for a romantic evening with your partner, or a girl's night out, our Strawberry Daiquiri slushy makes a great addition. Mix with a dry white wine, vodka or rum, and garnish with a fresh strawberry and a blast of whipped cream! Stir well and freeze for 3-4 hours or longer. Thaw for 20-30 minutes or until desired consistency. Mix with a wire whisk. Add and blend 2 cups of ice cubes at a time, until you have added a total of 6 cups of ice cubes. Frappé can also be poured & stored in a gallon-size freezer bag!